The bathroom situation in different countries can vary quite a lot. I’ve driven the length of Baja (actually 2 states: Baja California & Baja California Sur). I’m sharing some thoughts about the bathroom situation in case you might find it helpful. In 2018, for three months, I lived with my husband in a truck camper in Baja. The camper’s small and dry (meaning no bathroom). See a video Tour of the Inside of Our Camper HERE. 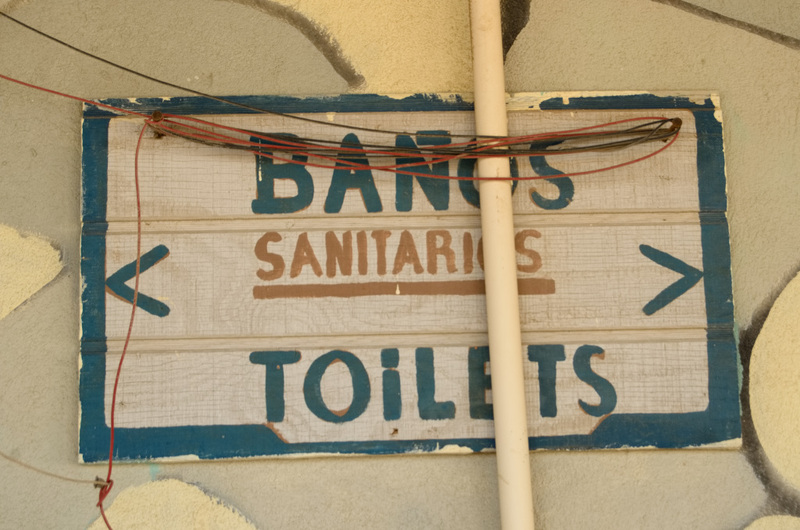 There are plenty of toilets in Baja. Some may not be what you’re used to but, they’ll serve the adaptable and intrepid traveler. If you are determined to be picky about bathroom aspects, be warned. One of my favorite things is beach camping. There’s nothing like opening the door to a beautiful waterfront view. We’ve camped at beaches and remote locations that had few, if any amenities. Some beaches are tended by locals. In exchange for a daily fee, you might expect trash receptacles, maybe a palapa (shade structure), and a pit toilet. A pit toilet is basically a hole dug into the ground, over which a toilet of some type is positioned. The precise details vary quite a lot. Some pit toilets have walls and a roof. While others could be a toilet seat over a hole in the ground and not much else. Modified port-a-pottys are popular as an outhouse. I’m talking about those plastic hut toilets that can be rented. These are fit over a hole dug in the ground. Those pictured below had rickety wood pallet’s serving as the “floor”. I say a little prayer that the floor holds! Occasionally, a bucket of lime is provided. Toss a scoop over your deposit for less odor & bugs. Of course, there are plenty of plumbed toilets too. We stayed at a variety of RV parks with bathroom facilities. Some are very nice. Others can be a bit rustic or even broken….like the one below. Even the indoor, porcelain toilets sometimes come with a twist. For instance The Bucket Flush. You’re provided a bucket…to fill with water (from a spout on the wall…or a barrel) to dump into the toilet. And now a word about toilet paper. Most of the septic systems aren’t equipped to deal with toilet paper. Thus, don’t flush the paper. You’re asked to place it in the trash instead. This is common. As a result of this practice, the paper is more oft than not, scented. Yes. Perfumed toilet paper. In fact, it’s difficult to find any that is unscented. I speculate this is intended to mask less pleasant smells associated with throwing used paper in the trash. If you’re only going to Cabo to hang at fancy resorts, I doubt you’ll encounter the types of toilets covered in this post. I’ve never set foot in the resorts of Cabo, but I imagine they have they have nice toilets in which you can flush your paper. You certainly won’t be digging a cat hole! But I guarantee, you’ll also be missing out on the true Baja experience. So that’s it. The bathroom situation can be different than the one you have at home but we certainly had no problem traveling in a tiny camper with no toilet. Want to see all our videos from Baja? CLICK HERE.